Showing results for tags 'e53'. Hi peeps My X5 is back in the shop again - got the brake light trifecta again. This is round 3(!) after previously having the ABS control unit repaired and then replaced after it failed again. But this time, after reversing out of a parking space and then moving off at low speed i noticed a juddering from the rear of the vehicle and resistance. Pulled over and turned it off, and then got off the main road. Was OK on the short drive home. Did it again then next time i did a short trip to the supermarket, but this time the brake system lights all activated and the judder stopped Nursed it in at low speed to Driscoll Motors this morning for them to look at. The bit of reading I've done points to this maybe being ABS Master Cylinder rear release valve sticking 😕 Ideas? Anyone had this issue before? 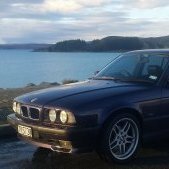 https://www.trademe.co.nz/motors/used-cars/bmw/auction-1512806063.htm?rsqid=31059e065698405daad1fb6f7d035165 @_ethrty-Andy_ some ideas for yours in there? camo, nudge bar, and black tiger claws. Though, surprisingly, still looking a bit MILD. Hi all - has anyone hit a problem with an electric seat reclining by itself randomly, which in turn triggers the alarm's motion sensor? Happens to be the driver's one. Any advice appreciated! Just picked up a new shopping wagon of sorts after a very long time of deliberation. I am sure it will turn into a project of some sorts. Daylight and photos to come. Needs a major screen upgrade, super dated. Just had a rear passenger window stop working on my X5 - youngest son put the window down all the way and heard a clunk :\ Can hear the motor going so sounds like it is a regulator issue. At least it wasn't raining!!! 2002 E53 X5 v8 in Welly - good nick & $5k starter price!